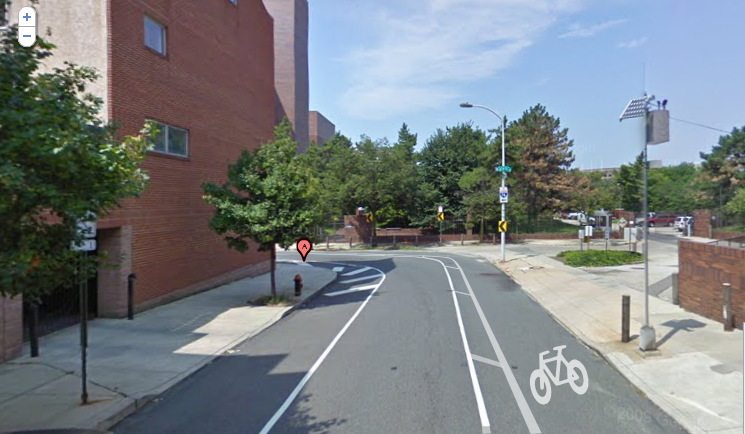 Greater Philadelphia Bicycle News: Buffered Bike Lanes For Lombard and South! Buffered Bike Lanes For Lombard and South! 13 months after the rollout of the buffered bike lanes on Spruce and Pine comes the new bike lanes on Lombard and South from 21st to the South Street Bridge. I envision legions of cyclists crossing back and forth over the South Street Bridge. I also envision Stu Bykofsky in a dark corner of his basement typing furiously. A quick and dirty rendering of the buffered bike lane at Lombard and 27th (via Google Street View). The Bike Lanes are likely to be striped by the first week of November. 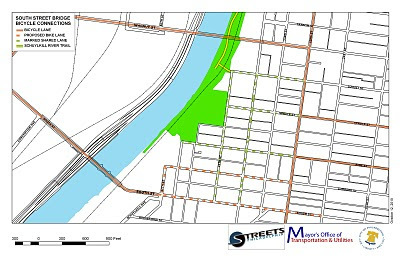 Next Spring plans are to add Sharrows on 24th and 25th Streets as well as on Locust from 25th to 22nd. Navigational signs will also installed, guiding bicyclists from Front Street/Penns Landing to the South Street Bridge and the University of Pennsylvania. Of course as we have seen before, life in the bike lane won't be a panacea. For example the Philadelphia School at 25th and Lombard will have school buses and vehicles unload and load students twice a day. The 40 bus which runs on a moderately frequent 15 minute schedule (30 minutes on weekends) will also provide some conflict. But with no major churches west of 22nd there shouldn't be too many parking issues on weekends. On the plus side you should be able pass by all the suburban and Delaware teens stuck in Saturday night South Street traffic. yes!!! yes yes yes! This is really going to make a difference! Fantastic! Should we expect to see more sharrows in the near future? There are many frequently-used routes where they could be effectively implemented.